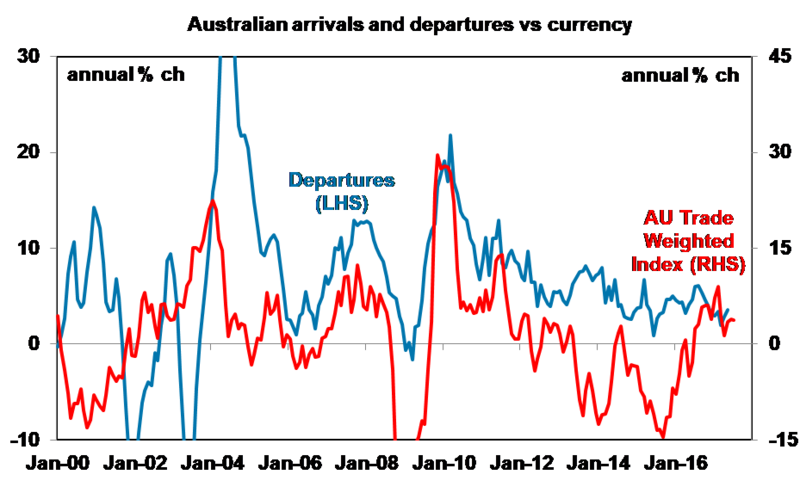 A tightening labour market alongside low wages has been a key dilemma for the Reserve Bank of Australia (RBA). Wages have grown at 1.9% over the year, just keeping up with inflation. This weakness has stemmed from a spare capacity in the labour market, future economic uncertainty clouding households and decreasing labour mobility. We have also seen a feedback loop between low inflation and low wages growth, along with a drop in wage growth expectations by workers. The RBA’s liaison program, as well as business surveys indicate that low wages growth (sub 2.5%pa) is expected to continue over the near term, despite a somewhat better employment backdrop. But, there is also an offset from low wages growth, which has allowed employment growth to hold up pace despite below-trend GDP growth. 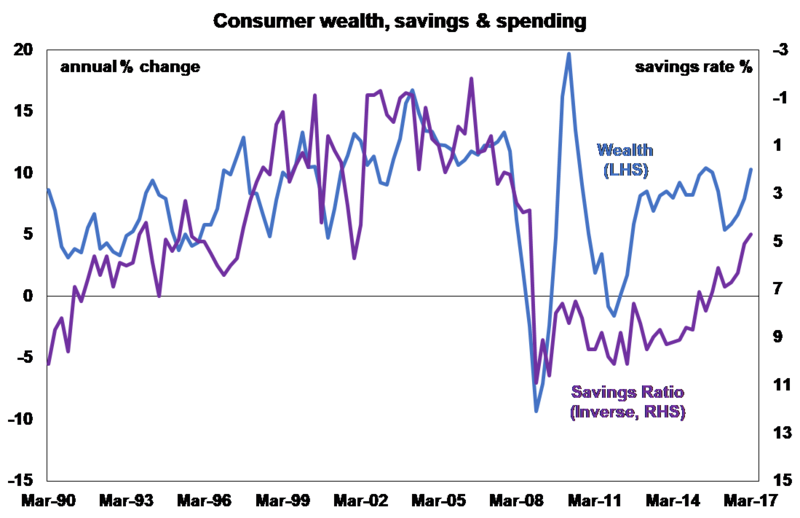 Another downside to soft wages growth has been the flow through into poor consumer sentiment. Not much can be done to improve confidence unless the economic environment becomes more favourable or consumers become more confident about domestic politics. 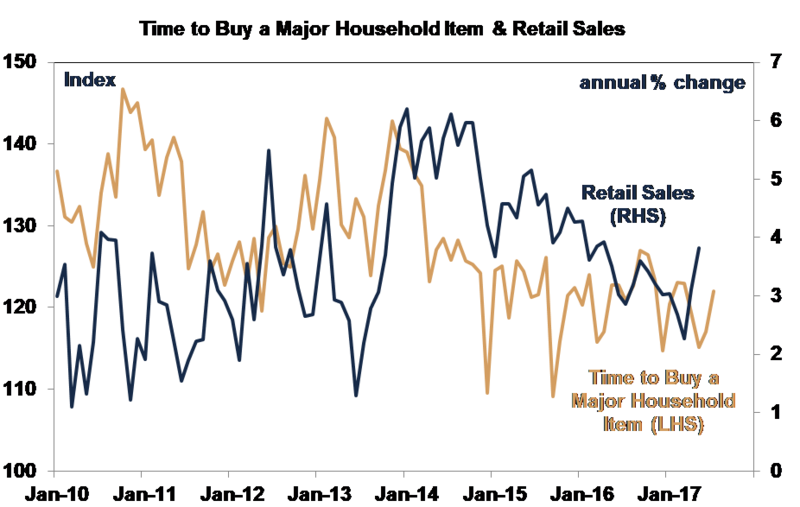 One of the components of sentiment we track is “time to buy a major household item”, which has actually been holding up better than overall confidence. But, despite a recent lift in this sub-index, the broad trend has still been down since 2014. The Australian household debt-to-income ratio has reached a record high and is also elevated compared to our global peers. High household debt is a constraint to consumer spending growth because consumers tend to be more cautious on lifting spending if debt levels and interest payments are high, especially if interest rates rise. The RBA’s concern about high household debt has been around the boom in lending to housing investors and the associated lift in interest-only loans, which is considered risky lending because of the vulnerability to any deterioration in economic conditions. We think the RBA will start to raise the cash rate towards the end of 2018 (if not later), but rate rises will be slow and gradual. Interest payments (as a percentage of income) are unlikely to increase much higher from current levels as we see the cash rate remaining on hold. But, once the RBA starts to normalise interest rates, interest payments could rise significantly because the stock of household debt has risen so much. The other risk in housing is around a slowing in dwelling price growth, as new supply flows into the market, mortgage rate hikes start to bite, affordability pressures build and sentiment towards housing turns more negative. Slowing dwelling price is negative for household wealth, which has benefited enormously as home prices skyrocketed, giving consumers more confidence to dip into savings, and allowing spending to rise. The physical arrival of Amazon in Australia is expected mid-late 2018. The most significant negative impact will likely be on retail prices, given heightened competition in the market. On our estimates, the “Amazon Effect” would shave around 0.3-0.4 percentage points off annual headline CPI growth at its peak, so the impact to underlying inflation may be somewhere around 0.1-0.2 percentage points. The price pressure hit to retailers will impact margins and profitability, similar to when online retailing gained popularity around 2012. But, the increase in choice and greater price competition will be a positive for consumers and household disposable incomes. Any increase in consumer disposable income is a positive for other parts of the retail sector that may see consumers demand goods or services for other areas. We are less concerned about Amazon’s impact on employment. While the retail industry is the second largest industry employer in Australia, there will be demand for Amazon employees in Australia across IT, marketing, sales and HR and distribution (which are already being advertised). Without a change in government policies around energy, there does not appear to be a reprieve from high electricity prices. However, a decline in the oil price could actually help lower electricity prices through the link to gas prices.